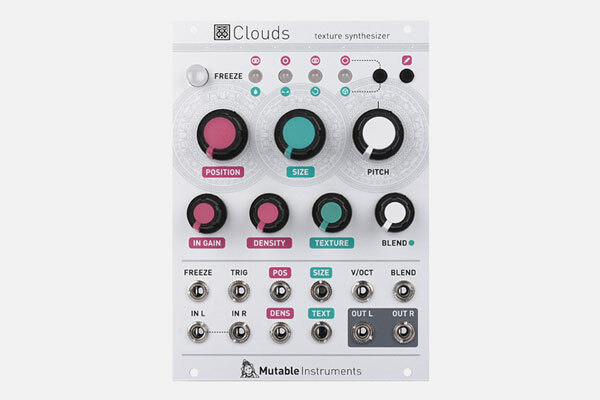 Clouds is a granular audio processor with a couple of twists. Unlike granular sample players, Clouds is focused on the realtime granularization of incoming audio signals, and the acquisition of textures from them. Classic controls such as grain position, size, and pitch are provided. Clouds can superimpose many grains simultaneously (at least 40, depending on the CPU used by its other features) and thus create thick textures. Control over texture density, independently of grain size, is thus provided. An external trigger input allows grains to be seeded in sync with LFOs or rhythmic generators.